Many people think of chemists as white-coated scientists mixing strange liquids in a laboratory. While that image is accurate for some chemists, chemistry is far more than that. Chemistry is part of everything we do, everything we eat, and everything we are. 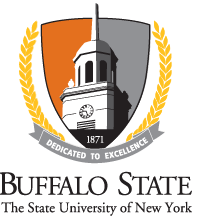 Understanding chemistry can help you understand the world around you—and Buffalo State College can help you understand chemistry in its Chemistry Program. Mark T. Miller received his bachelor’s degree in chemistry in 1994. Now, a senior scientist at Vertex Pharmaceuticals in San Diego, he’s a member of the research team that developed Kalydeco, the first prescription medicine to treat an underlying cause of Cystic Fibrosis. In 2014, he won Buffalo State’s Young Alumnus Award. The bachelor of science (BS) degree in chemistry offers a strong background in chemistry while providing students with two concentration options: traditional chemistry and biochemistry. Both concentrations are approved by the American Chemical Society. Graduates of the traditional chemistry program are fully prepared to assume entry-level positions as chemists with industrial or governmental laboratories or to begin more specialized programs of study at the graduate level. The biochemistry concentration prepares students for both professional programs in health-related professions and advanced studies in biochemistry. Small class sizes: Chemistry classes average 10 to 15 students, so that each student receives highly personalized attention. High-achieving students: The Chemistry Department gives out more than 20 awards to deserving students every year. Strong job placement: Most chemistry majors are able to find a job in the field near their desired geographic location within six months of graduation. Phi Lambda Upsilon: A national honor society for students in chemistry, Phi Lambda Upsilon is open to students based on specified criteria of academic achievement. Iota Sigma Pi: Iota Sigma Pi is a national honor society for women in chemistry. Membership is open to chemistry students who meet specified criteria of academic achievement. Professional Organizations: Our Chemistry Department is professionally affiliated with the American Academy of Forensic Sciences, the American Chemical Society, the National Academy of Sciences, and the Royal Society of Chemistry, World Science. Chemistry Forensics Club: This club, open to all students with an interest in forensic chemistry, holds chemistry-related activities both on and off campus throughout the year. Chemistry-specific scholarships: The Millacci-Brock Scholarship provides $1,000 to an incoming freshman or sophomore chemistry major. Many other more generalized scholarships opportunities are available as well.